The following is based on material from our book Contemplative Mysticism: A Powerful Ecumenical Bond, which is available from Way of Life Literature. “The Catholic Church rejects nothing that is true and holy in these religions. She regards with sincere reverence those ways of conduct and of life, those precepts and teachings which, though differing in many aspects from the ones she holds and sets forth, nonetheless often reflect a ray of that Truth which enlightens all men. Indeed, she proclaims, and ever must proclaim Christ ‘the way, the truth, and the life’ (John 14:6), in whom men may find the fullness of religious life, in whom God has reconciled all things to Himself. “The Church, therefore, exhorts her sons, that through dialogue and collaboration with the followers of other religions, carried out with prudence and love and in witness to the Christian faith and life, they recognize, preserve and promote the good things, spiritual and moral, as well as the socio-cultural values found among these men” (Declaration on the Relation of the Church to Non-Christian Religions, Oct. 28, 1965). This opened the door for the current interfaith dialogue that has resulted not in the Catholicization of paganism but in the further paganization of Catholicism. The call for interfaith dialogue has been repeated forcefully by every pope since Paul VI. “[I wish] to do everything possible to cooperate with other believers in preserving all that is good in their religions and culture. ... The church of Jesus Christ in this age experiences a profound need to enter into contact and dialogue with all these religions. ... All Christians must, therefore, be committed to dialogue with the believers of all religions, so that mutual understanding and collaboration may grow, so that moral values may be strengthened, so that God may be praised in all creation” (John Paul II, quoted by Bob Spencer, “The Challenge of Contextualization,” Faith for the Family, May-June 1985, p. 11). “I repeat with insistence, research and interreligious and intercultural dialogue are not an option but a vital necessity for our time. ... The people of today expect from us a message of concord and serenity. ... They have the right to expect from us a strong sign of a renewed understanding and reinforced cooperation” (Zenit, Feb. 1, 2007). One of the segments of the Roman Catholic Church that has responded in a big way to the call for interfaith dialogue is the Catholic monastic orders (Trappist, Benedictine, Franciscan, etc.). Since the 1970s they have developed intimate ties with their counterparts in pagan religions, and they have discovered that contemplative mysticism is an effective bridge for interfaith unity. Tilden Edwards observed that mysticism is “THE WESTERN BRIDGE TO FAR EASTERN SPIRITUALITY” (Spiritual Friend, 1980, pp. 18, 19). “The methods of concentration used in other religious traditions can be useful for removing obstacles to a deep contact with God. They can give a better understanding of the oneness of Christ as expressed in the various traditions and CONTRIBUTE TO THE FORMATION OF A NEW WORLD RELIGIOUS CULTURE. They can also be helpful in the development of certain potencies in the individual, for THERE ARE SOME ZEN-HINDU-SUFI-ETC. DIMENSIONS IN EACH HEART” (Mary L. O’Hara, “Report on Monastic Meeting at Petersham,” MID Bulletin 1, October 1977). “It is as one human family ... that we are called to live in harmony and to bring about justice and peace in our one world; and, as the author points out, FINDING ONE ANOTHER IN GOD IN PRAYER ‘is the shortest way between humans’” (Katherine Howard, “Book Review: Can We Pray Together,” MID Bulletin 80, January 2008). The Monastic Interreligious Dialogue is associated with the NORTH AMERICAN BOARD FOR EAST-WEST DIALOGUE (NABEWD). At its first meeting in January 1978 at a monastery in Clyde, Missouri, Robert Muller, a New Age leader at the United Nations, was selected as the organization’s advisor (Pascaline Coff, “Bridging Millennia through Dialogue,” MID Bulletin 71, Sept. 2003). Muller believes in the divinity of all men. Beginning in 1982 the NABEWD has sponsored exchanges between Catholic and Buddhist monks and nuns. The Buddhists visit Catholic monasteries in North America, while the Catholics visit Buddhist monasteries in Asia. This was done with the approval of the Dalai Lama, who was approached in 1981 while he was participating in a Buddhist-Catholic interfaith symposium at the Naropa Buddhist Institute in Boulder, Colorado. When the Catholics asked the Dalai Lama if he and his monks would be willing to participate, he replied, “Yes, but I have no money” (Pascaline Coff, Ibid.). The Catholics volunteered to pay the expenses, and the exchanges began the following year. Consider ST. JOSEPH’S ABBEY in Spencer, Massachusetts. Thomas Keating was elected abbot in 1961, and the centering prayer movement began there a decade later. Trappist monk William Meninger found a “dusty copy” of The Cloud of Unknowing, which teaches thoughtless meditation, and he and Keating and Basil Pennington began developing a system of contemplation based on that as well as the writings of John of the Cross and Teresa of Avila. Observing that this type of Catholic contemplation is very similar to that of Buddhist and Hindu mystics, they invited pagan meditation masters, including Zen Buddhist Roshi Sasaki, to teach at some of the retreats. By 2004, St. Joseph’s had become a full fledged Zen center. This was the fruit of interfaith contemplative dialogue. In April of that year Jesuit Robert Kennedy installed Trappist monk Kevin Hunt as the first American Trappist instructor of Zen (National Catholic Reporter, July 16, 2004). “Under the ‘protection’ of a Buddha statue and filing in to the cadence of a Japanese drum, the procession reached the Abbey’s Chapter Room. There the installment was made: after the imposition of hands whereby Kennedy made Hunt his successor, the latter received the ‘Robe of Liberation’ -- a black Japanese kimono -- and his teaching staff. “Fr. Peter-Hans Kolvenbach, General Superior of the Jesuits, wrote a letter praising Hunt’s achievement as ‘one that we can all celebrate in thanksgiving to God.’ According to Kolvenbach, it is through Zen meditation that Catholics can become aware of the loving presence of God. HUNT PREDICTS THAT BUDDHISM WILL CHANGE CATHOLICISM” (http://www.traditioninaction.org/RevolutionPhotos/A082rcTrapistZen.htm). At the conclusion of the dialogues they published a book entitled The Common Heart as an expression of their conviction that the things that unite them are greater than the things that divide. Contributors included Keating, Roshi Bernie Glassman (Zen), Swimi Atmarupananda (Hindu), Ibrahim Gamard (Islam), Pema Chodron (Buddhism), Netanel Miles-Yepes (Sufi), and Rabbi Henoch Dov Hoffman (Judaisim). The foreword to the book was written by New Ager Ken Wilber. Keating and the Snowmass Conference published eight “Guidelines for Interreligious Understanding,” including the following. * The world religions bear witness to the experience of Ultimate reality to which they give various names: Brahman, Allah, Absolute, God, Great Spirit. * Ultimate Reality cannot be limited to any name or concept. * The potential for human wholeness--or in other frames of reference, enlightenment, salvation, transformation, blessedness, nirvana--is present in every human person. This is blatant universalism, and it is fruit of contemplative spirituality and interfaith dialogue. In recent decades many Catholic priests have become Hindus and Buddhists, while remaining Catholics. The very influential Trappist monk THOMAS MERTON was “a strong builder of bridges between East and West” (Twentieth-Century Mystics, p. 39). He was a student of Zen master Daisetsu Suzuki and Buddhist monk Thich Nhat Hanh. In fact, Merton claimed to be both a Buddhist and a Christian. The titles of his books include Zen and the Birds of the Appetite and Mystics and the Zen Masters. He said: “I see no contradiction between Buddhism and Christianity. The future of Zen is in the West. I intend to become as good a Buddhist as I can” (David Steindl-Rast, “Recollection of Thomas Merton’s Last Days in the West,” Monastic Studies, 7:10, 1969, http://www.gratefulness.org/readings/dsr_merton_recol2.htm). JULES MONCHANIN and HENRI LE SAUX, Benedictine priests, founded a Hindu-Christian ashram in India called Shantivanam (Forest of Peace). They took the names of Hindu holy men, with le Saux calling himself Swami Abhishiktananda (bliss of the anointed one). He stayed in Hindu ashrams and learned from Hindu gurus, going barefoot, wearing an orange robe, and practicing vegetarianism. In 1968 le Saux became a hermit in the Himalayas, living there until his death in 1973. The Shantivanam Ashram was subsequently led by ALAN GRIFFITHS (1906-93). He called himself Swami Dayananda (bliss of compassion). Through his books and lecture tours Griffiths had a large influence in promoting the interfaith philosophy in Roman Catholic monasteries in America, England, Australia, and Germany. He eventually came to believe in the reality of goddess worship. WILLIGIS JAGER, a well-known German Benedictine priest who has published contemplative books in German and English, spent six years studying Zen Buddhism under Yamada Koun Roshi. (Roshi is the title of a Zen master.) In 1981 he was authorized as a Zen teacher and took the name Ko-un Roshi. He moved back to Germany and began teaching Zen at the Munsterschwarzach Abbey, drawing as many as 150 people a day. Benedictine monk JOHN MAIN, who is a pioneer in the field of contemplative spirituality, studied under a Hindu guru. Main combined Catholic contemplative practices with yoga and in 1975 began founding meditation groups in Catholic monasteries on this principle. These spread outside of the Catholic Church and grew into an ecumenical network called the World Community for Christian Meditation (WCCM). “Choose some object that you use frequently: a pen, a cup ... Now gently place the object in front of you or on your lap and speak to it. Begin by asking it questions about itself, its life, its origins, its future. And listen while it unfolds to you the secret of its being and of its destiny. Listen while it explains to you what existence means to it. Your object has some hidden wisdom to reveal to you about yourself. Ask for this and listen to what it has to say. There is something that you can give this object. What is it? What does it want from you?” (p. 55). Paulist priest THOMAS RYAN took a sabbatical in India in 1991 and was initiated in yoga and Buddhist meditation. Today he is a certified teacher of Kripalu yoga. In his book Prayer of Heart and Body: Meditation and Yoga as Christian Spiritual Practice (1995) and his DVD Yoga Prayer (2004) he combines Catholic contemplative practices with Hindu yoga. 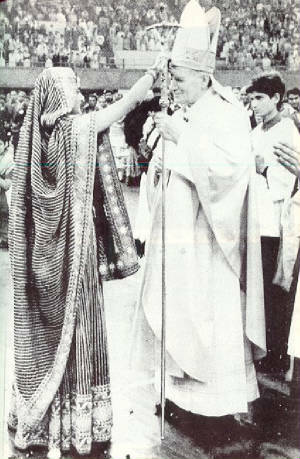 In October 1975, at a ceremony marking the 25th anniversary of the founding of the Missionaries of Charity, Mother Teresa and her nuns prayed before a Buddha (La Contre Reforme Catholique, November 2003, http://www.traditioninaction.org/RevolutionPhotos/A067rcMadreTeresaBudha.htm). “Sister Nirmala was today elected to succeed Mother Teresa. … A former Hindu, Sister Nirmala (63) was baptised in 1958. ... A calm and composed Sister Nirmala said ‘it is a big responsibility. Looking at myself I feel afraid whether I will be able to bear the responsibility but looking at god I think I can.’ … Sister Nirmala’s parents, high-caste Hindu Brahmins, did not oppose her joining the Missionaries of Charity. The relatives said that during trips to Kathmandu Sister Nirmala often visited Lord Pashupatinath temple, a sacred Hindu shrine which non-Hindus are not allowed to enter. She would offer prayers from the gate of the temple. ‘She told us that all gods were equal and worshipped them equally,’ said Ms Nina Joshi, Sister Nirmala’s niece” (The Deccan Herald, March 14, 1997, cited from News from the Front Newsletter, Take Heed Ministries, Belfast, N. Ireland, October 1997). In May 2004 a Hindu ritual was performed at Fatima. The Hindus placed flowers before the statue of Mary inside the Chapel of the Apparitions, danced and chanted, and a Hindu priest said a prayer. The Hindus placed a shawl covered with verses from the Bhagavad Gita on both the Rector of Fatima and the Bishop of Fatima (Frontpage, Portugal’s Weekend Newspaper in English, May 22, 2004). Preparations are proceeding with great rapidity for the formation of the one-world religion of Revelation 17. At a time when Catholicism is becoming increasingly pagan, evangelicals are becoming increasingly Catholic! Through the powerful ecumenical glues of Contemporary Christian Music and Contemplative Mysticism, charismatics and evangelicals are being drawn ever closer to Rome. This article is based on material from our new book Contemplative Mysticism: A Powerful Ecumenical Bond, which is available from Way of Life Literature.